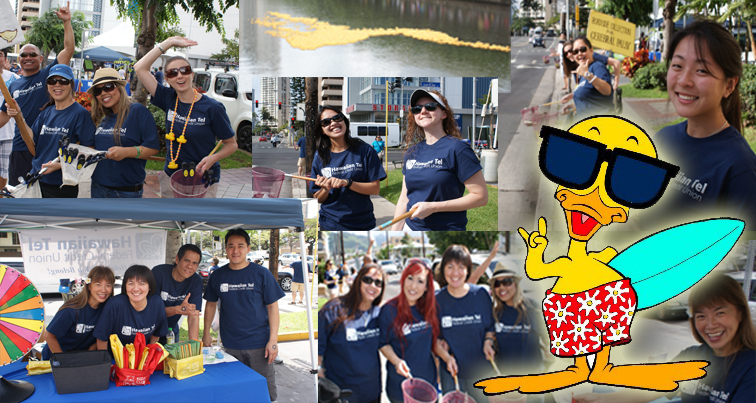 Mark your calendar and save the date for UCP’s 27th Annual Great Hawaiian Rubber Duckie Race on Saturday, March 22, 2014. HiTel FCU will participate in the pre-race festivities at McCully Shopping Center from 9:00am to 12:30pm. The race will promptly begin at 1:27pm from the Kalakaua Ave. Bridge. There is a $5 donation to Adopt-A-Duck and winners may win a variety of prizes from local sponsors. Hope to see you all there! This entry was posted in Kalakoa Musings and tagged adopt, Aloha Petroleum, Benefits By Design, Bishop Street, community, credit union, donations, Downtown, duck race, ewa beach, finance, Halekulani, hawaii, Hawaii Duck Tours, Hawaii Kool Gold, Hawaii School of Photography, Hawaii's Hot Country, hawaiian tel fcu, Hilton Hawaiian Village Waikiki Beach Resort, hitelfcu, honolulu, Kahu Palekaiko Motorcycle Club, Kaimuki, Kalihi, Kapalama, kapolei, Kualoa Ranch, kunia, mccully, McCully Shopping Center, mililani, Rising Phoenix Jaycees, Ruby Tuesday Hawaii, Ryder Transportation Services, Savers Stores, Schofield, Sea Life Park Hawaii, sponsors, The Fish, Wahiawa, Waikiki, Waikiki Beach Marriott Resort & Spa, Waikiki Yacht Club, waipahu, Wet 'n' Wild Hawaii, Wheeler AAF by Hawaiian Financial Federal Credit Union. Bookmark the permalink.